This mod is technically outdated, as this mod was last rebuilt for tAPI r15(I think?) which is not for the latest version of Terraria. I have decided to leave the Terraria modding scene, but do not be discouraged, I will not leave permanently. 2: I will come back, and finished what I started. However, while I can definitely say that I may start back on this in the future, it will not be in the near future. Hopefully by then, I'll have access to fully up-to-date modloaders with tons of features for me to choose from to make my ideas into a reality in full. I'm honestly really sorry I will not be continuing this again soon, or that there's the possibility of me no longer being the developer for this mod, but I will say that this has been the best 3 years of my life, as I love programming. ~falcon7370 approached me asking for permission to work on my mod, though he wanted to toy around with it before doing anything public, but he hasn't been online since last December, so I'm not sure of his current status. ~Recently, Iriazul asked for permission as well. I told him the current situation and he said he was going to go ahead and work on it, but I assume he'll stop or collaborate if it means avoid confusion and/or conflict. And also, next week (Aug. 22) I'm going to start college, and thus much of my free time will be taken up. However, while the mod may not be updated any time soon, the Wave Bank has been updated. Warning: This mod currently does not support multiplayer. 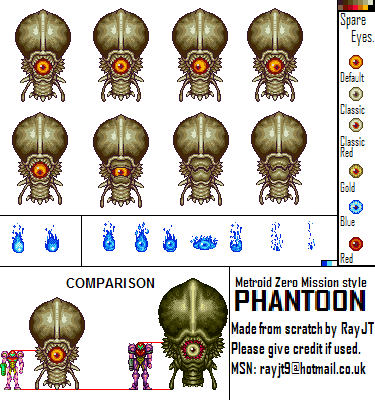 Metroid Mod is a Terraria mod I have been working on for 3 years now. It's a content and action based mod, featuring many items and game mechanics from the Metroid franchise. "Filled with the energy of the Corruption..."
"Somersault continuously in the air!" Currently unobtainable. Planned to be a drop from Ridley. "It's made of pure Phazon energy!" "An energy laser that fires concentrated nova energy, powerful enough to penetrate Phazon." "Gives the location of hidden ectoplasmic beings..."
"Highly concentrated Phazon, in its purist form." "Seems to react to kinetic energy, and amplifies it." Only Serris's head is vulnerable, and she will start speed boosting upon damaging it. Everything in this section is unobtainable, without the use of a cheat mod. Item files for the Dark Suit do not even exist yet, meaning you cannot obtain it even with a cheat menu. The only files that do exist are the textures. The Power Beam overheats when used excessively. A meter, located under the charge meter, indicates how much the Power Beam is overheated. The Overheat meter will cool down at a rate of 30 points per second (0.5 points per game frame). However, the player can use Concentration (default: R) to cool it down at a rate of 120 points per second (2 points per game frame). When the Power Beam is fully overheated, the player must wait until it cools down enough before they can fire it again. Somersaulting is an aesthetic game mechanic, triggered by doing a second jump with the Space Jump, Space Jump Boots, or the Screw Attack. Although it's aesthetic for the Space Jump (Boots), it's actually needed to be triggered in order for the Screw Attack to function and damage enemies. Somersaulting only works in the air, as it's obviously disabled once the player lands back on the ground. The player is also needed to keep moving left or right in order to stay somersaulting, as Space Jumping in place will keep somersaulting disabled. The Power Beam and Missile Launcher are very useful weapons, as various addons can be made to make these weapons more powerful. Addons can be installed by selecting the Power Beam/Missile Launcher in your hotbar and pressing the appropriate key (default: Q). As you know, in Super Metroid, combining Spazer and Plasma Beam was an impossible feat. The Power Beam by itself cannot function with both the Primary A and B slots in use, unless an upgraded Charge addon is installed. The Charge Beam V2 allows the use of combining Primary A and B addons. The Charge Beam V2 is also a lot more advanced in that it completely changes the way every beam looks, each new look resembling the beams from Metroid Fusion and Metroid Zero Mission (whereas the beams originally resemble beams from Super Metroid). The Missile Launcher only has 2 addon slots, and one expansion slot. These slots are designated as Charge and Primary, whereas the Expansion slot doesn't count as an addon slot. A Phazon Meteor will be created on world generation, as the last thing to be generated. The Phazon Meteor looks just like a normal Meteor consisting of normal Phazon, but the center of it will consist of a red Phazon Core. Phazon, as well as the core, cannot be mined by normal means, such as pickaxes or drills. The only tool capable of mining out any of the meteor is the Nova Laser. Simply mining one block of the core will cause the entire core to explode (watch out, it can hurt), and upon doing so, it will cause the world to generate Phazon, with the phrase, "Your world has been corrupt with Phazon!" The player then can find Phazon underground like any other ore.
Every power suit has a Sense Move ability. Sense Move is a dodge ability, originally from Metroid: Other M, which can be activated by holding the Sense Move key (default: Shift) and pressing Left/Right when an enemy is coming after you. Sense Move is entirely Work In Progress, as it's far from perfect. So expect changes to its behavior in the future. These options mostly include key customizations, but it also includes other little options, such as turning on/off the HD particle effect for the Phazon Beam, or other options for the X-Ray Visor's Head Tracking. Sometimes when firing a beam consisting of more than one shot, one of the shots will be delayed by a frame and the shots will be offset. This does not affect the damage, however, it's a bit funky looking. Please report bugs as you find them. I really wanna fix as many as I can. Fixed crash caused by shooting the Wave-Spazer combo off the edge of the map. Skeletrons arms are no longer freezable. Bomb damage tool tip added to Morph Ball. New! Overheat System added! Beams now overheat rather than use mana! Player's run physics are now a bit more 'slippy' when in Morph Ball form, giving it the feeling of actually rolling. Reworked Grappling Beam. Should now be more bug-free. Ice Beam debuff reworked. On top of not being able to freeze bosses, it also cannot freeze enemies who have 3000 max HP or more. Speed Booster can no longer be equipped when the player already has the Space Booster equipped and vice-versa. Space Jump can no longer be equipped when the player already has the Space Booster equipped and vice-versa. Morph Ball can no longer be equipped when the player already has the Morph Ball V2 equipped and vice-versa. Fixed Morph Ball recipe typo. It now requires Gold Bars instead of Silver. Missile Launcher can now alternatively be crafted with The Undertaker. Fixed bug where de-equipping Morph Ball while it was active would cause graphical glitches. Instead the player simply returns to normal when it's de-equipped. Serris's Speed Boost ability has been adjusted to be more lethal. Green Plasma Beam tweaked. Should be more viable for crowd control. Terraria and Metroid are owned by Re-Logic and Nintendo respectively. I made this mod for entertainment and educational purposes only. I highly recommend using Shockah's Fancy Cheat Menu, as it will greatly help in obtaining items that were meant to be obtainable but either had an unfair recipe, or had no recipe at all. Impzor The Starfox, Fruitbat, eduardokirbyfun and 34 others like this. Dwagon and Joost8910 like this. Can't wait to try it! Also what else is planned? Or I can give you a wall of text. Oh my god I love you. This has always been one of my all-time favorite mods for Terraria, and you created it masterfully. In fact, I can easily see myself making a whole new character and world just for this one mod. It deserves its own unique play-through. Joost8910 and OmegaN9 like this. I can highly agree on that. And it'd be highly appreciated if you gave me your feedback on your playthrough. I wanna make sure everything is balanced as much as possible. Holy this looks like the best mod I've ever seen. Too bad I can't play it hardly at all because it lags so ing much. It lags when you play my mod? For a bug like that, I'd need some serious coding help. I can barely do anything at all. I can't open the cheat menu to see the items! My computer is absolule , so that might be the problem. Or that this is by far the largest mod I've ever seen, at 31 megabytes. Aside from your computer being crappy, are there any other bits of information you can give me? Do you at least have any suggestions for making my mod run faster. It only lags when I open my inventory. It just takes me 5 minutes to put the item in my inventory, but once it's there I'm good. Or more specifically, Mod Interfaces. I'm using a heavy bit of custom mod interface code to make the Power Beam and its addons work properly. I'll have a look around there. Edit: By the way, what are all of the items in your inventory? Or specifically, what items from this mod do you have? OOH! Is this the same mod that was over on the Terraria Online forums? OMG IF IT IS ITS FINALLY RELEASED OMGGGG! EDIT: seriously, some of the mechanics in there are absolutely insane good! I have Shockah's Fancy Cheat Menu. The items in my inventory are from Vanilla Terraria and from my mods. At least I was able to get the boss summoners, which were the main reason I got this mod. I was not disappointed with the bosses. Truly amazing. Speaking of which, I forgot to credit Empio. He originally created Phantoon, although I edited him a bit. Has it ever lagged before with Shockah's Cheat Menu? I'll check this out, looks very unique. _Mish and Scooterboot9697 like this. Unfinished, is the more appropriate term. Well, good luck with the coding! Wait... It can't be.. NO WAY. 1264 LINES OF CODE FOR PHANTOON? ARE YOU SERIOUS? Can I Get Uhhh and ShadowTiger like this.